This article was first published by Global Research on 12 March 2004 under the title “Financial Bonanza behind the 9/11 Tragedy: Who are the Financial Actors behind the WTC?” On September 11, 2015, we will be commemorating the tragic events of 9/11. The original URL was http://globalresearch.ca/articles/CHO403B.html. The article focussed on “verifiable facts” available in the wake of the 9/11 attacks. The Article presented a short timeline of major financial transactions pertaining to the WTC implemented in the months preceding the September 11, 2001 attacks. Three major interrelated transactions occurred involving the Blackstone Group, the New York and New Jersey Port Authority, Silverstein Properties, Westfield America Inc. The transaction was authorised by Port Authority Chairman Lewis M. Eisenberg. Silverstein took control of the lease of the WTC following the Port Authority decision on April 26. 1. Silverstein Properties Inc. is a Manhattan-based real estate development and investment firm that owns, manages, and has developed more than 20 million square feet of office, residential and retail space. 2. Westfield America, Inc. is controlled by the Australian based Lowy family with major interests in shopping centres. The CEO of Westfield is Australian businessman Frank Lowy. 3. The Blackstone Group is a private investment bank with offices in New York and London; It was founded in 1985 by its Chairman, Peter G. Peterson, and its President and CEO, Stephen A. Schwarzman. 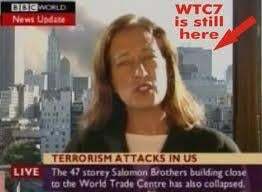 As we recall WTC building 7 (The Salomon Brothers Building) which was not hit by the planes, collapsed mysteriously in the afternoon of September 11. The announcement of its collapse by the media (CNN and BBC) occurred more than 2o minutes prior the actual collapse. Blackstone chairman Peter G. Petersen is also Chairman of the Federal Reserve Bank of New York and Chairman of the board of the Council on Foreign Relations (CFR). His partner Stephen A. Schwarzman is also a member of the Council on Foreign Relations (CFR). Peter G. Petersen is also named in widow Ellen Mariani’s widow civil RICO suit filed against. George W. Bush, et al. 4. Kissinger McLarty Associates, which is Henry Kissinger’s consulting firm has a “strategic alliance” with the Blackstone Group “which is designed to help provide financial advisory services to corporations seeking high-level strategic advice.” (www.blackstone.com) . 2. See Paul Goldberger in The New Yorker, May 20, 2002. 3 C. Bollyn, “Did Rupert Murdoch Have Prior Knowledge of 9/11?” Centre for Research on Globalization, globalresearch.ca, 20 October 2003. 5, Associated Press, 22 November 2003. See also Die Welt, Berlin, Oct 11, 2001.